For many of you, life insurance is a secondary market and not your primary focus. Even so, you probably write life insurance when your clients ask you about it. We wrote this post so you can grow your bottom line revenue by selling more life insurance with less headache. Most agents tell us that it takes too long, there is too much paperwork, and they find it awkward. The list of reasons to avoid it could go on and on, but that does not change the fact that many people need insurance and do not buy it unless someone brings it to their attention. In a recent LIMRA survey, 50% of Americans thought they needed more life insurance, and 60% of those said no one had approached them about life insurance in the last two years. That’s a huge opportunity! Keep it simple to start, and break your existing client base into four quadrants. All of your existing clients fit into one of these categories. Take a moment with the following questions and you can develop a quick, easy roadmap for starting the conversation. 1. Where are most of your clients on the chart? 2. Who do you enjoy spending your time with? 3. Have you covered all the concepts with your clients? 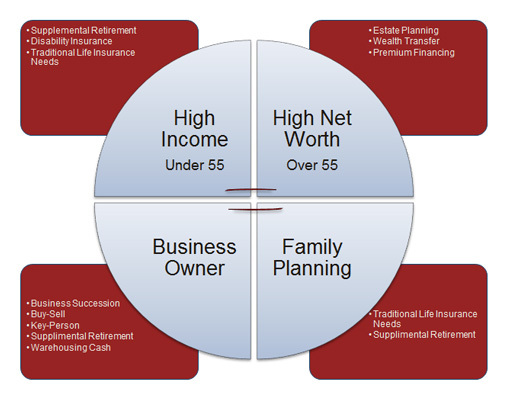 These are just a few of the many life insurance opportunities that you can further develop. Starting simple and working through a list of names is an easy way to increase your per-client revenue. Advisors that find success cross-selling introduce the topic in a very different way. They start the conversation with a statement about their beliefs and give the client the opportunity to engage. It usually sounds something like this: >We believe protecting your family and your business is unbelievably important. Many of our clients tell us that they find tremendous value in a brief life insurance review because often times we are able to help them improve their coverage or reduce the price they are paying for their existing life insurance. >Do you mind if I ask you a few questions about what you have now, what you want your coverage to do, and what factors you considered when purchasing the policies you have currently? This simple introduction is proving to be very effective. We get this question a lot from agents and advisors considering adding life insurance to their suite of services. The short answer is no. We can hold your hand through the case design phase, complete the application for you, and then help you get it through underwriting quickly.